Reduces the risk of cow's milk allergy. Have you, your partner or any older children have a food allergy, hay fever, asthmaor eczema? Then your child has an increased chance of developing an allergy.This manifests itself in babies often cow's milk allergy. Therefore, Friso was a H.A.power developed. 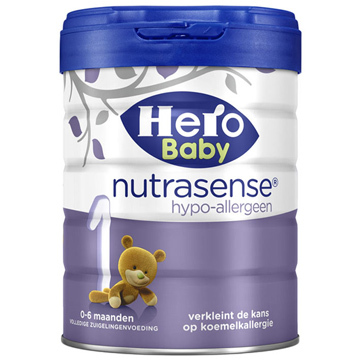 This is an infant formula in which the proteins have been pre-treated (cut into fragments), so the risk of the development of a cow's milk allergyis much smaller. Knowing whether your baby at increased risk of cow's milk allergy? Check theallergy pointer Friso. Friso is constantly working to improve her bottle feedings. For Friso H.A. 1 and 2, we have both the taste and the recipe can be improved. The change of formula for your baby will be hardly noticeable. If desired, you canpresent Friso H.A. mixing with the new formulation for an even softer transition. Powder Structure: the powder structure is more compact than the current Friso HAThis does not affect the solubility of the powder. Spoon color: the color of the spoon is yellow, so it is clear that the new formulationis concerned. Always use the scoop that, when the package has been added.